Outdoor Cap is changing the way you sell headwear with our new Business Development Kits. Outdoor Cap has over 40 years of headwear expertise, making us an authority on cap trends and consumer needs. We wanted to take headwear in a new direction by offering a universal, perfect fit that empowers customers. We designed a streamlined cap with seamfree construction that provides all-day comfort with a sleek, minimalistic style. We are proud to add OneTouch to our line of high-quality headwear. A unique knitting technique is used to create fabric in a rounded shape removing the need for multiple panels and seams, resulting in a single continuous panel that creates a perfect fit every time. You can find all four of our OneTouch styles—REEVO, SHIFT, FLIGHT, and EDGE—on all three OC pages: Promotional Products, Outdoor Sports, and OC Sports. Check them out and join the revolution. Companies within industries that pride themselves on their ability to stay up-to-date on modern trends like technology, education, and entertainment are a perfect fit. Markets that have a young target demographic like specialty beverages, non-profits, and real estate will value the sleek, trendy design. Sectors with a more mature audience will appreciate all that OneTouch has to offer, especially those with significant expendable income like financial, health care, or those in the hunting and fishing markets, since OneTouch is a higher end product. Use your OneTouch Kit to generate ideas for reaching out to any of the above-mentioned institutions and close more sales. At Outdoor Cap, we want to help you win the sale. When you succeed, we succeed. That is why we are offering these selling kits to you. 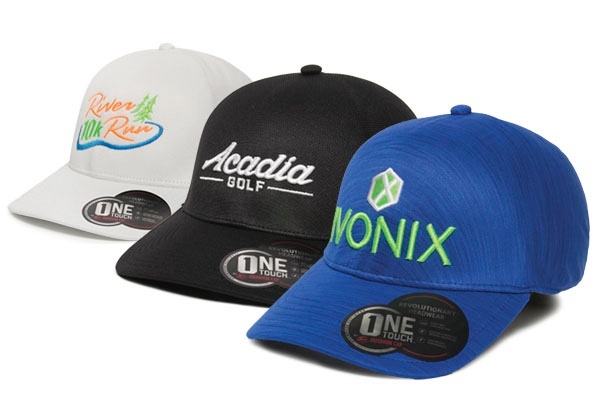 It is important to us that your customers realize and take advantage of the value promotional headwear can bring them. CLICK HERE to order your OneTouch Business Development Kit, today. We offer selling kits periodically; you will be first to know when new kits are made available. If you have any questions, please use the comments below to ask us anything. You can also follow us on Facebook, LinkedIn, and Twitter for more updates. Emily is the Content Marketer for Outdoor Cap Co. She holds an M.A. in AD & PR from the University of Alabama and a B.B.A in Marketing. Emily is an avid Crimson Tide football fan. She has a golden retriever named Opie Winston, and a cat named Tide.